The most exciting battle of all time is about to start again! 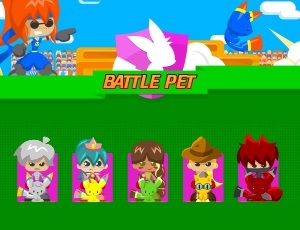 For thousands of years Pet Battle happens. This year the team Braves have only one representative, Marin. The team of Renegades have 5 fighters! Who will win? Each fighter has their Ink, a mixture of cat with rabbit. The Ink have to move the boxes and get to the center, to win the match. Be careful when choosing your box, or the opponent's attack can get you! And you will have to return there to start!